The "Big Five": this term, now used by Tour Operator's and Driver/Guides was originally invented by big game hunters in Africa. These animals were chosen for the difficulty on hunting them and not their size : that's the reason why the leopard is listed and not the hippopotamus. Are the largest of the cats and are almost white to deep ochre brown in colour with tawny yellow being the most common colour. They grow thick woolly manes that vary widely in length and colour. Their tails are long, often with a dark tip. The roars of both sexes can be heard at night from up to 8 km away. This roaring advertises the position of Lions. Group roaring identifies a prides presence and unity, and it discourages other Lion from entering territory previously occupied by other pride. 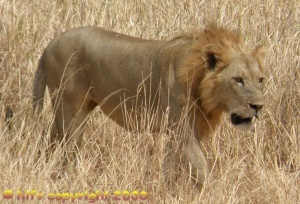 Male lion weigh up 260 kg and have a shoulder height of up to 128 cm. Their preferred prey weights 45 to 300 kg. Gestation period is 100-113 days. Are solitary (except when mating) and nocturnal animals that live in broken terrain away from Lions, Hyenas and People. Thus, the visitor is more likely to see their kill hanging in a tree in their “larders” before seeing them. They are the largest of the spotted cats, with black or brown rosettes on the back and upper limbs. Between their variably spaced rosettes, they are deep orange to tawny brown in colour. Leopard weight up to 90 kg and measure about 250 cm in length from the tip of their nose to their tail. Gestation period is 90 up to 95 days. 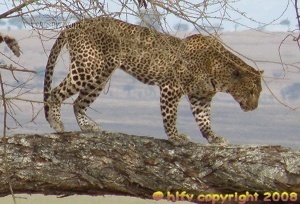 The best pleas to see Leopard is Serengeti National Park. The rhinoceros is a prehistoric animal whose forebears date back many millions of years. It is the second largest animal in Africa after the Elephant. The Black and the white rhinoceros are related and their skin is similar grey in colour. 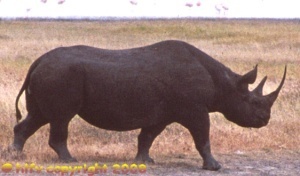 In fact, black rhinoceroses are now called Browse Rhinoceros and White Rhinoceroses are called Grass Rhinoceros. Gestation period is 547 up to 578 days. The best pleas to see Rhino is Ngorongoro crater. 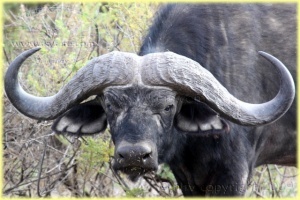 The buffalo is one of the animals very dangerous, their live up to 100,000 herds. a Buffalo can weigh up to 850 kg and grow to 170 cm in height. They have thick, bossed horns and drooping, tasselled areas. the horns carried by both sexes, and the intervening boss set between the horns , are used to bludgeon a victim. Gestation period is 300 up to 330 days .Buffalos usual are every where in the National Parks. African Elephants that live in the wild have a life expectancy of up to 60 years. They stop growing at about 20 to 25 years of age. No living animal exceeds the elephant in height at the shoulder; the bull elephant from Angola mounted in the foyer of the USA museum in Washington, measure just over 4 metres. Exception bull elephant can weigh over 6 tonnes while females tip the scales at about two –third of this amount. Bulls usually join the herd only when a female is in oestrus. Thereafter, they rejoin the male herds or remain on their own. 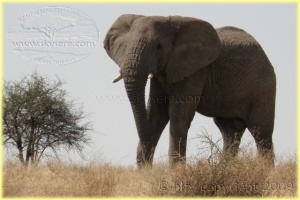 Gestation period is 22 up to 24 months .The Tarangire National Park is home for the Elephants some times up 150 together.